A MAN DIED after being shot multiple times in Dublin this morning. The shooting happened at the Marigold Crescent estate in Darndale with gardaí saying they were called to the scene at 6.30am. The man, who was in his 30s, was rushed to Beaumont Hospital but has since died. A post-mortem will be carried out this afternoon by Dr Michael Curtis at the City Morgue. 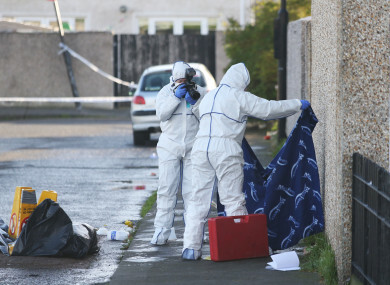 A large number of gardaí remain at the scene of the shooting which is being preserved pending a technical examination. A second scene in the Greenwood Avenue area of Donaghmede, where a burnt-out car was discovered, is also sealed off. Investigating gardaí are appealing for anyone with information or anyone who may have witnessed this incident to contact the incident room at Coolock Garda Station on 01- 6664200, the Garda Confidential Line 1-800 666-111 or any garda station. Email “Burnt-out car found after man shot dead in north Dublin housing estate”. Feedback on “Burnt-out car found after man shot dead in north Dublin housing estate”.